T-Messenger is an application that combined the usual features of a messaging client with the Twitter API, offering the novelty of the users who still are listed as contact list and can send messages as if a window conversation is involved. Just double click on a contact, send the message and see their responses on the same conversation window in real time. T-Messenger also works as a regular Twitter client and allows you to create groups of users, send a picture using drag-n-drop, automatic url shortening via bit.ly and also if you exceed the 140-character limit it will make multiple tweets allowing you to post whatever you want without having to worry about making your message smaller. 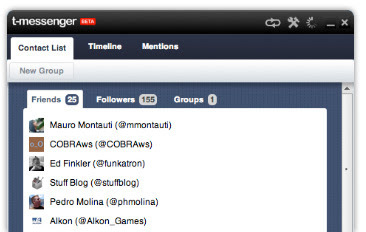 T-Messenger is built on Adobe AIR, so it is possible to use it on Windows, Mac OS X and Linux.